Hello y’all! I hope you had a great Thanksgiving (if you’re not tired of hearing it yet.) This week I’d like to share few of my sketches of movie poster designs about motorcycles. I watched Easy Rider and The Wild One specifically for this assignment. SPOILER ALERT! I’ll mention the plots of the movies below so scroll down at your own risk, lol. Reference from the motorcycle that Peter Fonda rides in the movie. I simply let the shape of the handle bars dominate the layout and lead the viewers’ eyes. The alternative idea is inspired by the ending of the movie when one of the riders Billy, played by Dennis Hopper who’s also the screen writer of this one, got shot by a rifle. With the expectation of a typical American road trip movie, the ending of Easy Rider shocked me. It turns out, Easy Rider isn’t easy at all…So I have this image in mind, I want the viewers to wonder where the rider is while Billy’s cowboy hat blowing in the wind…indicating his death. 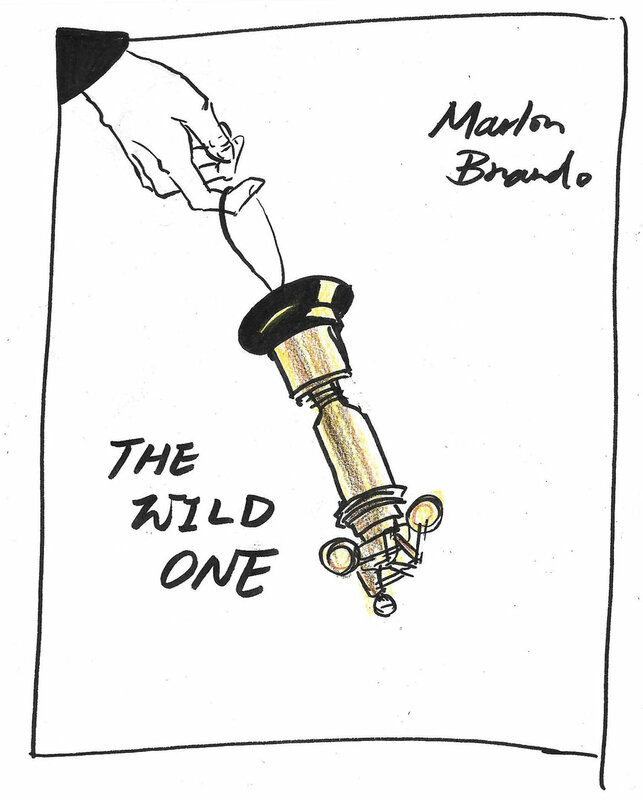 The second movie is Marlon Brando’s The Wild One. Riding his own motorcycle on set and with the wardrobe of his own, Marlon Brando certainly created a fashion icon of the 60s which still remains classic today. So instead of depicting him, I let this classic look stand alone by itself. I’m intrigued by Marlon’s performance in the movie. Although I’m always distracted by his voice, I like how he added little details to the characters to enrich its life. Remember his character Johnny always likes to dangle the stolen trophy from his hand? I like this setting because it makes Johnny feel more boyish. Instead of holding the trophy firmly, this dangling gesture indicates Johnny’s personality and his mental status. Have you seen the movies I introduced today? Let me know what you think!